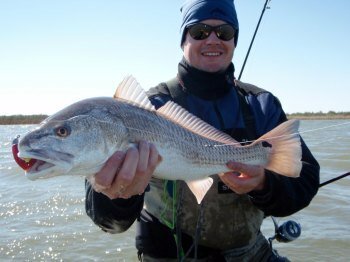 Winter Fishing: A Magical Time along the Texas Gulf Coast. Think for a minute about the pictures of the biggest trout you've seen, both in magazines and on the bulletin boards of the fishing stores you've been in. What you will find is that 90% of the time the fisherman in the picture is wearing a warm jacket, wool hat, and a huge smile on his face. This is because Winter is the best time to catch a huge trout along the Texas Gulf Coast! One of the keys to finding fish along the Texas Gulf Coast during cold weather is to find muddy bottoms. Fish are cold blooded creatures, and will seek out warmer water. Baitfish will be there and gamefish will follow. Mud is important because it warms up more quickly than anything else when fronts subside. This time of year it really pays to be wading so you can feel the bottom. The presence of shell in the mud is also good, as these transitions and broken bottoms give baitfish places to hide. While we're on the subject of mud, let's talk about water clarity this time of year. Often times, the bluebird days a couple days after a cold front blows through will create very clear, calm water. During these times, baitfish will have fewer places to hide. One lesson I learned fishing with Chris Martin of Bay Flats Lodge was to look for murkier or muddy water in the bays. This may be the result of redfish stirring up the bottom or any number of other reasons. What it will mean though, is cover for the baitfish and/or cover for game fish looking for a little cover themselves to ambush bait. Mullet are the prime food source during the Winter. There is less bait during any other time of year, so you don't need to be looking for large schools. Finding just a few mullet in an area is a good indication that there will be redfish and trout lurking. It pays to be alert, just like a hunter. You may also see the occasional slick during your Winter Fishing, another good indicator that baitfish and gamefish are present. Mullet imitations are the most effective Winter Fishing lures. It pays to work the lures slowly and to make sure you are fishing the entire water column, especially close to the bottom. An effective strategy is to bump larger soft plastics along the bottom and to slowly work suspending or slow sinking lures. Corkies are an excellent lure this time of year, especially Fat Boys and Devils. Darker colors are the most effective in off-color water. Larger soft plastics like Trout Killers by Texas Tackle Factory, Devil Eyes by Brown Lures, and Norton Sand Eels are also good choices. I recently picked up some of the new Killer Flats Minnow XL's by Texas Tackle Factory and am looking forward to trying them out. And don't forget larger Topwaters during the times when it's warmed up after a front and the wind is back from the South or Southeast. Tidal movement is just as important during the Winter, and it pays to know when the greatest movement will occur. Check the tide charts before your trip so you know when this will happen, and then pay attention when you're on the water. One way to take advantage of tidal movement is on a falling tide. During these times, finding cuts and drains from marshes and back lakes that have warmed up will help you locate fish. Shallower water will warm more quickly when the sun comes out, and these marshes and back lakes are often mud. Speaking of movement, if you've read the Tides page you know that Wind is another major water-mover and it pays to know how this can help you catch more fish. Finding a windward shoreline can mean finding fish, especially if there is a gut near the shoreline. Wind will blow water and flood these shorelines. The wind will also move bait towards these shorelines, and give bait some cover in the flooded grass. I've caught a lot of redfish along these windward shorelines while fishing out of Bay Flats Lodge. That's where the red in the picture above came from. During the coldest times right after Winter fronts, fish will seek out deeper water and hug the bottom where it's warmest. When it begins to warm up, they'll transition to shallower areas and then move into the shallows during the warmest times between fronts. Finding these transitional areas is a good way to locate fish. And when these areas have mud and shell bottoms you have a good indication that fish will be there. When the intracoastal runs along through a bay you know you'll have these transitional areas, and if flats are near you'll have another place to look for bait and fish when it warms up. Winter Fishing can be a magical time along the Texas Gulf Coast. There will be a lot less traffic, and the opportunity is there to catch a trophy trout or monster redfish. Work your lures slowly, and look hard for baitfish activity. Finally, remember to dress in layers and be prepared for rapid changes in weather if a front is approaching. Return from Winter Fishing to the Finding Fish page.